Your admission to this story is a ticket to a time machine. If you're a latter-day Bruce Springsteen fan who became an aficionado of the man's music and live shows in the decades following the 'Darkness' tour and you think you have an idea of what one of his live shows is like, sit back: you're about to discover the exciting truth. If you were there in '78, you are about to be transported back to a brief moment in time.The 'Darkness on the Edge of Town' Tour: "History is Made at Night"… That was then. This is now. Sound engineer Bruce Jackson during sound check. SOUNDCHECK – Do you hear what I hear? Much has been made on recent tours about the varying quality of sound at Springsteen concerts from venue to venue, and sometimes within the same venue in different locations. 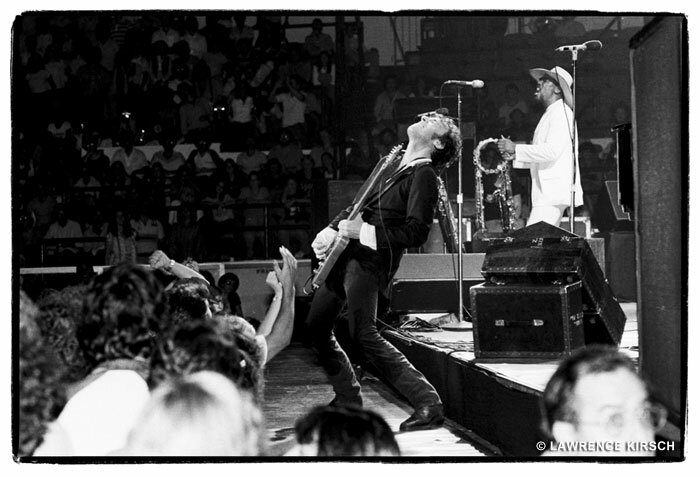 The ‘Darkness’ tour was distinguished for the now-legendary two-plus hour sound checks, where Springsteen himself would tour the arena while the E Street Band played in order to judge the sound. Much of this practice was no doubt a vestige of his initial reluctance to play hockey arena-sized venues in light of his audience intimacy and sound concerns, but in truth, the sound on that tour was great – it had to be, as the spoken song intros and stories played a major role in that tour’s message. You had to be able to understand what was being said. OPENING ACT – Getting in the Door. We all know the progression of ticket acquisition. Some of us remember Ticketron, sleeping out on the sidewalk the night before an on sale date, box office lines, then the advent of jammed phone lines, onsite venue scalper transactions, and, ultimately, internet sales. In 1978, you found out about a Springsteen appearance through your local FM radio station. You had no idea where the tour was the week before, or the week after your show. 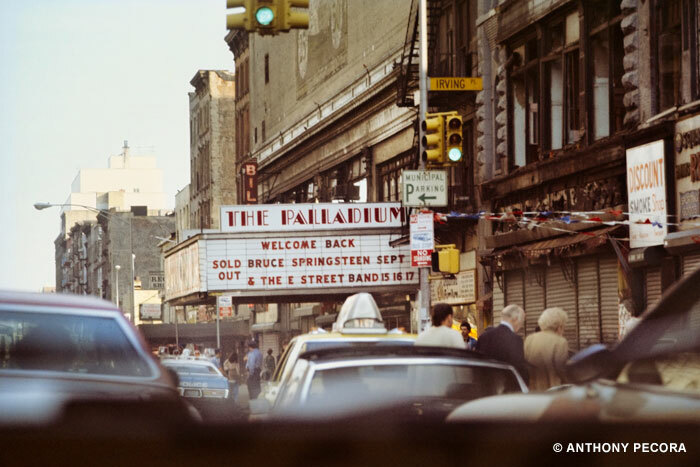 Tickets for the August 1978 shows at Madison Square Garden were made available via lottery by clipping a coupon in an ad that appeared in the New York Times Arts and Leisure section in late June. The coupon was mailed and you crossed your fingers that you would win the jackpot. Three weeks later two tickets arrived in the 8th row, Clarence’s side of the stage, for night two of the three show stand. Yes, things were different back then. THE FANS - Same cast, different demographic.A stateside Springsteen show these days probably has a median age of about 38, with half the audience above, and half below that age. In 1978, the median age was about half that. 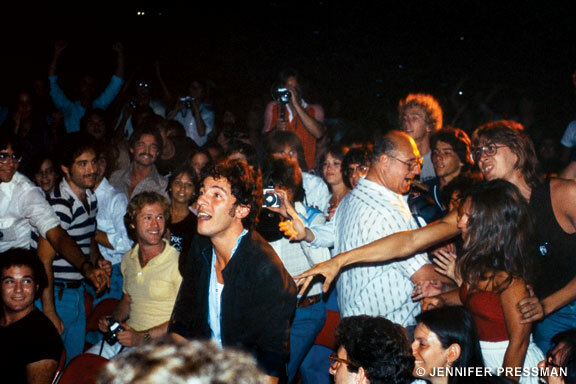 Looking around a Springsteen concert in 1978, you saw an audience of people ranging from about 16, to about 28 years of age. There were the "veterans", and by "veterans", you're talking about people who went back as far as the Upstage Club, and instant converts, in many cases people who had been dragged to the show by someone who had already seen the light. The conversation in that era used to go something like this: "Do you like Bruce Springsteen?" "No, not really." "Have you ever seen him live?" Nowadays you'll hear someone at a show wax poetic about the 'River' tour, and it's a true oracle moment for a younger fan. I'll never forget a conversation I heard during intermission at the Garden in '78. It was between two guys who were comparing notes from the Upstage Club and the Student Prince in Asbury Park, back when Springsteen was essentially a guitar slinger sitting in with jam bands. To put it in perspective, ten summers ago we were all at the Meadowlands for the reunion tour shows. "Ten summers ago" in 1978 put you on the Jersey shore in 1968 in the era of the Bruce Springsteen Band, Dr. Zoom and the Sonic Boom, and Steel Mill. THE FIRST SET – Just waitin’ to get blown away. The best way to describe what you felt when the band walked out onto the boards and ripped into the opening number (whether it was ‘Good Rockin’ Tonight’, ‘Summertime Blues’, ‘High School Confidential’, or ‘Badlands’) is to harken back to the old Maxell tape ads, where the guy puts a Maxell tape into his stereo and the sound that comes out of the speakers blows his hair and his scarf back, and sends his drink skidding across the table through the sheer force and power of its volume and energy. Much has been written and said over the years about the sense of desperation and emotion driving Springsteen on that tour – it’s all true, and then some. Trying to explain it can sometimes seem as daunting a prospect as the challenge put forth by John Sebastian in the Lovin’ Spoonful’s “Do You Believe in Magic?” in that “It’s like trying to tell a stranger about rock and roll.” Bruce and the E Street Band, compared to now, played fast. And they played loud. Not “The Who loud”, but loud enough to trash your ears for a day after the show, regardless of your rock show-going experience. The opening set was heavy on ‘Darkness’ album material, and the songs were augmented, enhanced, and accessorized in a way that doesn’t happen these days. The organ/piano intro to the title track, the extended harmonica/piano intro to ‘Promised Land’, the now-legendary piano/guitar intro to ‘Prove It All Night’, the extended piano coda to ‘Racing in the Street’, the ‘Not Fade Away’/’Mona’/’Gloria’ lead-in to ‘She’s the One’, along with the instrumental break in the middle of it – these flourishes made the songs even more special, and these types of reworkings are not seen much anymore. By the time ‘Jungleland’ closed the first set, some first-timers in the crowd thought the show was over, such was the quality and quantity of what was delivered in the opening set. THE SECOND SET - Are you ready for round two?About ten songs long, the second set usually included "story time" in the midst of 'Growin' Up', where we would learn that Springsteen was once a teenage werewolf, had contact with aliens, and as the product of a Catholic school upbringing, got to meet God himself in choosing a vocation, where he was told to "Let it Rock!" by the Big Skipper on a Clarence-organized trip to heaven. Second sets often opened with the unreleased instrumental gem 'Paradise by the C', and, later in the tour, with another as-yet unreleased song, 'The Ties that Bind'. 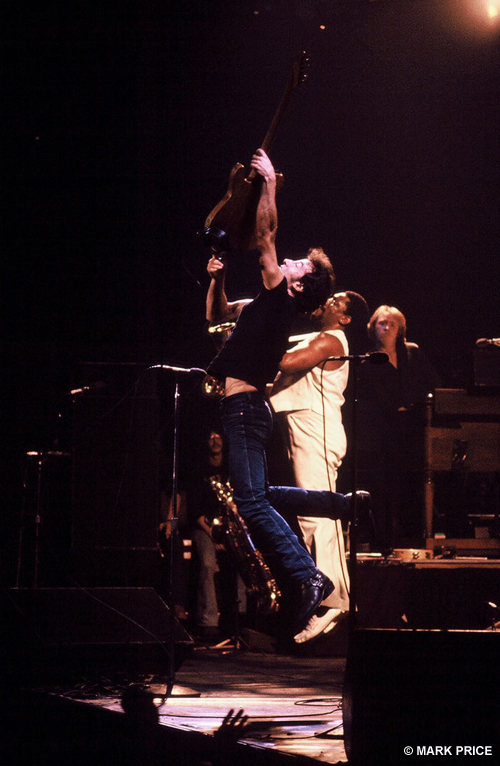 This, in and of itself, is illustrative, that Springsteen would play songs with which the audience was unfamiliar, including Springsteen-penned songs like 'Fire' and 'Because the Night', which became show staples and highlights even though they were associated with other artists. By the time 'Rosalita' closed the second set, and you'd screamed yourself hoarse during the band intros, you were wondering if you had anything left for the encores. THE ENCORES – Don’t make me have to hurt you! The encores are really the third set, and by the time the show proper ended with ‘Rosalita’, it was hard to imagine that the energy could be taken to another level. It was, of course…the usual midsummer encore was ‘Born to Run’ (with a heartfelt “thank you to the fans for sticking with the band during the tough times”), ‘Because the Night’, and ‘Quarter to Three’ (those were the three encore songs for the three night stand at Madison Square Garden). The ‘Detroit Medley’ would work its way into the rotation for the fall, along with an occasional ‘Raise Your Hand’ or ‘Twist and Shout’. The feeling as you left the building was one of utter exhaustion. You had nothing left as a fan, and it almost seemed as if Springsteen was on a mission to outlast you, to prove that he had more energy than the collective reservoir of the assembled mass. If the first set was your apps and the second set was your main course, the encores were dessert. The arc of the show was no accident, and by its end it had peaked, leaving people high-fiving each other on the way out, “Broocing” themselves in the street, and literally sharing in a communal celebration of what they had just witnessed. THE RIDE HOME – Can you believe that leap he made from the speakers? The ‘Darkness’ era had no online chat rooms, instantaneous set list dissemination, or Internet vehicles upon which to discuss Springsteen’s music or career. Your ride home was your debrief, and in that ride home, one of the major topics of discussion was the physicality of a Springsteen show. He was on top of the piano during the ‘Thunder Road’ outro before stage-sliding into Clarence. He was ten rows deep into the audience during ‘Spirit in the Night’. He was on top of the speakers, on top of the drum kit, and careening across the stage during the encore ‘Quarter to Three’ or ‘Detroit Medley’. His leaps at the end of songs could be measured by their verticality. In short, he was a force of nature, with energy emanating from his very being as if he were supercharged by lightning. Springsteen had been away for three years, and in that primitive media era, he may as well have been on the dark side of the moon. The sense of desperation, release, exhilaration, and resurrection engendered by the album’s release and its subsequent tour were once-in-a-lifetime occurrences for the man and his fans, and comprised a 7-plus month moment in time never to be repeated. 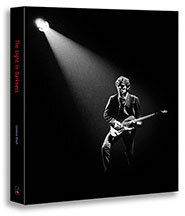 Limited Edition Bruce Springsteen book, The Light in Darkness. IF you have ever considered buying this book, Now is the time. and over seventy more, this book is a must have. With less than 30 copies left, now is the time to order this collectible book. We are offering savings on Shipping anywhere in the world. Wow… awesome article. You nailed it. So exciting to read this. Darkness is my favorite album because of all the details you outlined. Darkness brought me so much joy. Still does after all these years.